Immigration Lawyer in Houston | The Law Office of Kathryn N. Karam, P.C. With the election of a new president in November 2016, our immigration system has undergone some major changes. TPS programs are ending, DACA is in flux, and all cases being scrutinized much more rigorously. Congress has failed to pass laws to reform our immigration system. We're dealing with a set of laws that are decades behind the current economic and social needs of our country. Whether you're a small company looking to hire an employee, a family trying to stay together, a victim of a crime, or a professional with years of experience in your field, it's more important than ever to have a specialized and experienced attorney helping you navigate the U.S. immigration system. At Karam Immigration Law, we help our clients keep straightforward cases on track, and we deal with complicated situations and work to find solutions. Kathryn Karam and her team help families, businesses, entrepreneurs, victims of crimes, and others with everything from the green card processes, temporary visa applications, citizenship and naturalization issues, problems entering the country, removal defense, and any other immigration-related issues. Kathryn is an experienced attorney who has worked both for large law firms and in immigration clinics, and has trained her team to bring that experience handling complicated matters to your case.The team at Karam Immigration Law (formerly Kathryn N. Karam PC) won the 2017 Award for Best Service-Based Company under 10 employees at the Business Excellence Forum, and Kathryn was awarded the 2018 Global 7 Award for International Business Service. Attorney Nina Amadi works with the Law Office of Kathryn N. Karam PC exclusively practicing immigration and nationality law. She is experienced in family-based employment-based, Violence Against Women Act cases-based, employment-based adjustment of status interviews, and citizenship and naturalization issues. Attorney Vy Van Ky assists with family and employment-based green card processes, temporary work visas, and citizenship and naturalization issues. She is fluent in English and Vietnamese. Call Karam Immigration Law today at (832) 582-0620 to schedule a consultation to discuss your matter. Karam Immigration Law works with businesses and people throughout the Greater Houston area, including the Energy Corridor, Bellaire, Spring Branch, Cypress, Tomball, The Woodlands, Sugar Land, Alief and Clear Lake. Noted as one of the Top Immigration Lawyers in Houston, Kathryn and her team also service clients Internationally and throughout the US. When you need help with your immigration case, don't take chances just to get it done quickly, and don't risk having problems later on just to save money now. We're living in a time when there is more scrutiny on immigration applications than ever before - the stakes are high. This is a time to be careful and deliberate about what you’re doing. Your immigration case is an investment in your life in the United States. A Board Certified Immigration Lawyer can follow changes in case processing and filing procedures and changes in interpretation of law by USCIS, ICE, and immigration courts. Read more about why you should not cut corners and hire a form filer or notary to file your important immigration paperwork in our article, A Better Image for Your Immigration Forms in Houston. Before pursuing a career in law, Kathryn Karam spent a significant amount of time abroad, particularly in China, as she sought a bachelors degree in Chinese Studies from Trinity University. There, she experienced firsthand what it's like to be an outsider in an unfamiliar place. She decided to attend law school at the University of Texas School of Law, one of the top-ranking programs in the country, because she wanted to work in an action-oriented career that would allow her to help people. She possessed an innate skill at solving puzzles and complex problems, and knew being an attorney would allow her to exercise that skill for good. In law school, she realized that her problem-solving skills could be put to work for people experiencing in this country what she did in China. She decided she would pursue a career in immigration law. Kathryn Karam worked with the Political Asylum Project of Austin (now known as American Gateways) and as a Student Attorney in the UT School of Law Immigration Clinic. Our Mission is to make the United States stronger by keeping talented, innovative, and skilled people here and keeping families together. We help our clients navigate the United States immigration system. We provide creative and personalized solutions for the complex problems our clients face, and we strive to achieve the best results possible. In July 2013, Kathryn Karam decided to branch out on her own and founded The Law Office of Kathryn N. Karam, P.C.. She is fluent in Mandarin Chinese and conversational in Spanish. She is a member of the American Immigration Lawyers Association, and has coordinated efforts to lobby Congress for immigration reform for AILA.After earning her juris doctor and becoming admitted to the Texas Bar, she worked for FosterQuan LLP, one of the most prestigious immigration law firms in the nation. She assisted with matters for companies big and small, and individuals on a broad range of matters. She also worked for major firm Greenberg Traurig LLP on employment-based nonimmigrant and immigrant cases for large corporations. Kathryn Karam is Board Certified in Immigration and Nationality Law by the Texas Board of Legal Specialization. Board Certification is given by the Texas Board of Legal Specialization to attorneys that demonstrate the highest public commitment to excellence in their area of law. Less than 10% of licensed Texas attorneys are Board Certified and many of the top immigration attorneys in Houston, TX, have earned this important distinction. Houston in an international city, with companies that have reach around the world. Businesses in Houston are able to seek the best and brightest from across the globe. However, actually getting these talented people into the United States requires getting through the U.S. immigration system. Employees coming from other countries will require either an immigrant visa or a nonimmigrant visa, depending on whether the position is a permanent or temporary one. The type of visa will also depend on the necessary qualifications for the job, the employee's individual qualifications and, sometimes, the country from where they are coming. Kathryn Karam has extensive experience as a lawyer working with large corporations to small businesses on many types of employment-based immigration matters. She is able to find innovative solutions to problems that can arise, including tentative nonconfirmations, requests for evidence and notices of intent to deny. Whatever the immigration law needs your business faces, Kathryn Karam is able to assist you. Kathryn Karam Interviewed: Sinovision Chinese TV Station. A key purpose of immigration law in the United States is to promote family unity. Unfortunately, the law is broken, and that purpose can often be ill-served. If you are seeking to help spouses, children, parents or brothers and sisters become permanent residents, citizens or visit the United States, the process can be long and complicated. Having an attorney as a guide can mean avoiding many complications, and having an advocate who is ready to handle them can make a tremendous difference in the outcome of your family member's immigration process, including deportation proceedings. Kathryn Karam has been working to help unite families in Texas since she was still in law school, and still helps people come to the United States or remain here. Kathryn Karam can also assist any person with other family-based immigration matters, including assisting victims of domestic violence, crime victims seeking refuge, and juveniles seeking to immigrate to the United States. Bringing You the Best: Exceptional Legal Counsel for Your Immigration Matters. If you are seeking to bring a talented worker into the Houston area, to unite your family, to halt a removal proceeding against yourself or a loved one, or are facing any legal matter involving the immigration system, a skilled attorney can make the difference in your success. Why Should I Pay for a Consultation with an Immigration Lawyer? Pay for a consultation with an immigration lawyer so you have time to explain your situation and be sure you understand the risks involved in your case. For attorneys, time is money. If you get a free consultation with an attorney, it’s not likely to last very long. You also want to come away with valuable, information and legal advice. And, there's something very true about the old saying, "you get what you pay for." To read more reasons why you should consider a paid consultation and advice on how to vet your lawyers, read our article, "Why should I pay for a consultation with an immigration lawyer?" 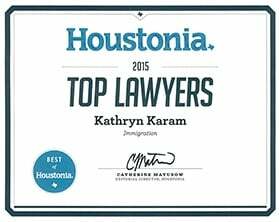 Kathryn Karam is an experienced immigration lawyer in Houston, Texas, who assists businesses, families and individuals with their immigration and nationality law matters.